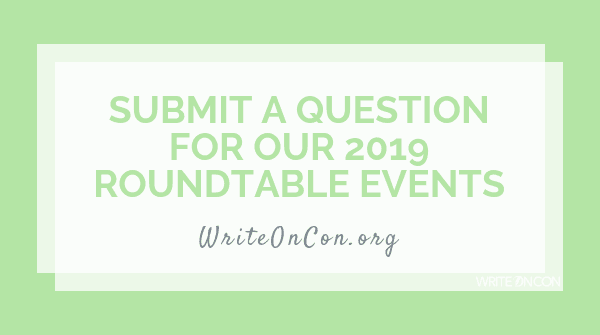 In addition to our Live Q&A events, WriteOnCon 2019 will also host writer roundtable panels, in which many writers offer their individual perspectives to the same questions. While these events will be in a written format, our conference attendees will still get the chance to submit questions! This is your last chance to get those questions in! We’re collecting your Q&A submissions here. The form will close at the end of the day November 30, after which we’ll select the most unique or broadly helpful questions and present them to our panelists. The roundtables will take place during WriteOnCon 2019, February 8-10, 2019, so if you haven’t already, be sure to buy admission! There’s less than a week left in our early bird campaign, in which you can buy admission starting at just $1. Then check the events in February for a chance to see your question answered!